Brisbane City Council has approved the Impact Assessable DA lodged by AM Brisbane CBD Investments, a joint venture between Ashe Morgan and DMANN Corporation. Key elements covered by the approval include a new laneway connection between Charlotte and Mary Streets, three additional podium levels, the ability to infill between the two existing buildings and increased building height for the extension to create the premium sky rise levels. Midtown Centre will merge two dated office buildings at 155 Charlotte Street and 150 Mary Street into a single new commercial tower with a new public laneway. The transformation will deliver 42,000 sqm of PCA A Grade office accommodation with Premium lifting. 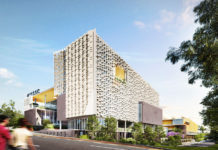 The campus style podium floor plates are some of the largest in Brisbane, 2,400 – 2,500 sqm, which allow highly flexible and connected workplaces. The tower floors plates are designed to facilitate agile working and range between 1,750 – 1,950 sqm. 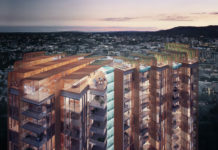 Project Director, Michael Bruderlin, said the Midtown Centre’s visionary design and environmental credentials were key in gaining the DA approval, which garnered strong support both within Council and from the people of Brisbane. “The building embraces and enhances its natural environment in many ways. The land area equivalent has been dedicated to outdoor spaces throughout the building that will promote wellbeing, social and collaboration spaces. This, together with the large floor plates that have an abundance of natural light, 3-level mixed-mode naturally ventilated atriums and the iconic Level 20 sky garden are all key elements driven by the Buildings that Breathe philosophy,” Mr Bruderlin said. The Buildings that Breathe philosophy is the gold standard for architectural design to create productive, healthy workplaces and is the foundation of the Brisbane City Council’s New World City Design Guide. 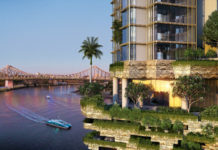 Director of AM Brisbane CBD Investments David Mann said the approval was exciting news for Brisbane’s corporate community. “Opportunities for large format tenants to occupy buildings of this quality and make-up are rare. We are extremely excited to offer large users the opportunity to position themselves at the literal centre of the CBD, ” Mr Mann said. “We anticipate Midtown Centre will be completed by mid 2020, delivered in a window of low new supply in the Brisbane CBD office market. Midtown Centre has been designed by architecture firm Fender Katsalidis, whose extensive work includes MONA in Hobart and Eureka Tower in Melbourne. Firm Founding Partner and Managing Director Karl Fender OAM, worked directly on the Midtown Centre design and believes the project will become a global exemplar for re-purposing aged commercial building assets. The restoration of the heritage Charlotte Street facade will be guided by Urbis and in strict accordance with Brisbane City Council’s heritage guidelines. It is proposed that the adjacent footpaths be widened to facilitate greater engagement with the heritage facade and the newly activated Mary Charlotte laneway. Interiors and workspaces will be designed by Hassell, while Landscape Architects Lat27 will be responsible for shaping the outdoor green spaces incorporated into the building. The original Midtown Centre DA article can be viewed here.